RADIUS invites visitors to explore and enjoy art, music, movies and delicious foods. The art exhibits and fresh menu selections in the café are just part of the backdrop provided for meetings, concerts, banquets and more. 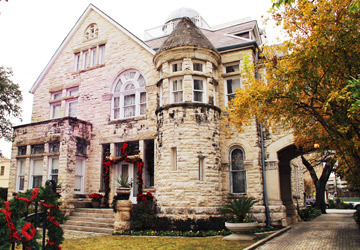 Surrounded by history and architecture downtown on the Auditorium Circle, Radius houses a community of art- and education- oriented nonprofit organizations inspiring the community through furtherance of their missions. Radius seeks to provide free access to the arts in an inviting contemporary setting to entertain and engage the community. In addition to the cost savings and synergy resulting from the cooperative, Radius generates engaging programs and a wide range of activities, including book signings, art exhibitions, and discussion groups. Radius also offers artist-in-residence/guest residence programs to help support individuals and nonprofit organizations. 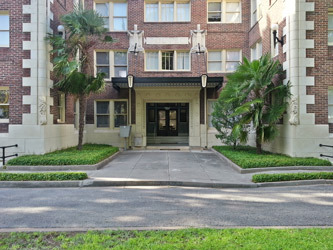 Rooms are reserved in the Historic Toltec Apartments (1913) across the street from the Tobin Center and the San Antonio Riverwalk. Additionally, part of the Radius Mission is to provide communal space where nonprofit organizations are better able to fulfill their missions and where individuals are inspired to dream and to do. Any group is encouraged to contact the Radius office concerning building usage to accommodate the group’s mission and needs.